static final; others were just static. 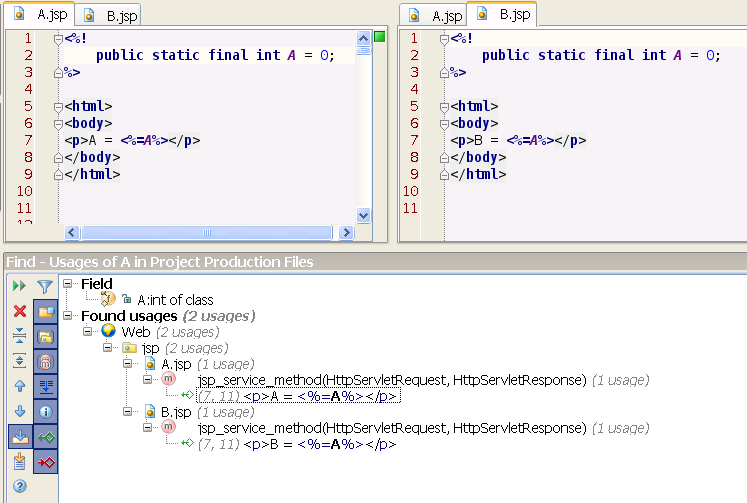 For example, look at the sample case below A.jsp and B.jsp. They both declare a constant A.
will show both usages in A and B.
the JSP compiler you will have two classes A_jsp.java and B_jsp.java. Because the Find Usages is wrong, many other IDEA fuctions also fail. to A in the B.jsp file even though those refer to B_jsp:A.
reference in A.jsp, it will stay say there are references in B.jsp. So, the main problem seems to be the find usages. if anyone has run into this. Ok I added the Jira request to the pile. I'll say a prayer tonight that this is fixed sometime during Demetra.